A test battery (IMAP) for performing an in-depth assessment of auditory and cognitive abilities contributing to listening skills is described. It is quick to administer, child-friendly and free from linguistic confounds. Stimulus generation and protocol management are controlled via a software platform (IHR-STAR) to ensure replicable procedures. Barry, J. G., Ferguson, M. A., Moore, D. R. Making Sense of Listening: The IMAP Test Battery. J. Vis. Exp. (44), e2139, doi:10.3791/2139 (2010). The ability to hear is only the first step towards making sense of the range of information contained in an auditory signal. Of equal importance are the abilities to extract and use the information encoded in the auditory signal. We refer to these as listening skills (or auditory processing AP). Deficits in these skills are associated with delayed language and literacy development, though the nature of the relevant deficits and their causal connection with these delays is hotly debated. When a child is referred to a health professional with normal hearing and unexplained difficulties in listening, or associated delays in language or literacy development, they should ideally be assessed with a combination of psychoacoustic (AP) tests, suitable for children and for use in a clinic, together with cognitive tests to measure attention, working memory, IQ, and language skills. Such a detailed examination needs to be relatively short and within the technical capability of any suitably qualified professional. Current tests for the presence of AP deficits tend to be poorly constructed and inadequately validated within the normal population. They have little or no reference to the presenting symptoms of the child, and typically include a linguistic component. Poor performance may thus reflect problems with language rather than with AP. To assist in the assessment of children with listening difficulties, pediatric audiologists need a single, standardized child-appropriate test battery based on the use of language-free stimuli. We present the IMAP test battery which was developed at the MRC Institute of Hearing Research to supplement tests currently used to investigate cases of suspected AP deficits. IMAP assesses a range of relevant auditory and cognitive skills and takes about one hour to complete. It has been standardized in 1500 normally-hearing children from across the UK, aged 6-11 years. Since its development, it has been successfully used in a number of large scale studies both in the UK and the USA. IMAP provides measures for separating out sensory from cognitive contributions to hearing. It further limits confounds due to procedural effects by presenting tests in a child-friendly game-format. Stimulus-generation, management of test protocols and control of test presentation is mediated by the IHR-STAR software platform. This provides a standardized methodology for a range of applications and ensures replicable procedures across testers. IHR-STAR provides a flexible, user-programmable environment that currently has additional applications for hearing screening, mapping cochlear implant electrodes, and academic research or teaching. This protocol is aimed at both researchers and clinicians. It briefly outlines: (i) the IMAP ('IHR multicentre study of auditory processing') test battery which is based primarily on the use of nonverbal AP tests, (ii) information on the factors introduced into the battery to ensure a successful child-centric approach, and (iii) a step-by-step guide to describe the test procedure to be used with children aged six years or older. The IMAP battery provides a comprehensive auditory and cognitive assessment which can be administered in about one hour. It comprises a total of 10 tests: five AP tests, based on non-linguistic materials, a speech-in-noise test, a sustained attention test, designed to assess attention in both the auditory and visual modalities, and four cognitive tasks that assess reading, verbal short-term memory, working memory and nonverbal intelligence (NVIQ). Brief descriptions of these tests are provided in Appendix A. During testing, auditory stimuli are delivered through comfortable, high quality headphones (e.g. Sennheiser HD25) and the child responds via a colorful, three button box (Figure 1). The IMAP test battery is presented via the IHR-STAR (IHR System for Testing Auditory Responses) platform test. This software platform comprises a suite of programs for generating stimuli, controlling the order of presentation of AP and cognitive tests, and ensuring that test protocols are adhered to. Figure 1. A child being tested on the IMAP test-battery. 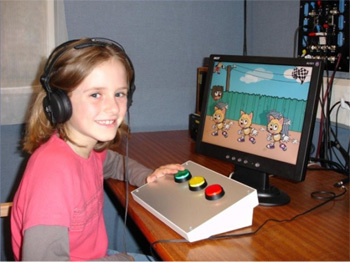 The key features to notice are the colorful button box, the use of headphones through which sounds are presented, and the child-friendly images on the computer-screen. Two 'tracks' are presented for each AP test. The tracks each comprise 20 trials, where a trial is a sequence of three stimuli (inter-stimulus interval 400 ms): two identical 'standard' stimuli and a different, 'target' stimulus. The location of the target stimulus is varied randomly within the sequence and child is required to identify the 'odd-one-out'. This is called a three-interval, three-alternate forced-choice (3I-3AFC) oddball response paradigm (Figure 2). Figure 2. 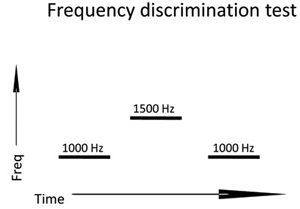 Illustration of a trial in a test of frequency discrimination. There are three intervals i.e., three tones. Two tones are the same (1000 Hz) while the third one is different (1500 Hz). This is the target. The standard tone in IMAP is a 1000 Hz for all tests. The parameters for the 'target' tone depend on the AP-test and details are provided in Table 1. During testing the relevant parameters for the 'target' are varied according to the child's previous response using an 'adaptive', staircase method which is designed to converge quickly on an estimate of threshold (i.e., minimum detectable difference). See Table 1 for a summary of the different rules for step-size changes for the AP-tests. Stimulus and response data are stored electronically for later extraction and analysis. Table 1. Stimulus parameters and adaptive rules for the AP and VCV tests. S = standard; T = target. Specific elements internal and external to the software are used to enhance and maximize the child's engagement with the protocol. Communication. It is essential to establish a good rapport between the tester and the child. This includes using age-appropriate language, presenting the test session as a series of 'games to play' rather than 'tests to perform', talking directly to the child (not just to the parent) and using appropriate child-friendly body language. A standardized dialogue has been developed for each test (see Appendix B), which ensures instructions are clear and age appropriate. The tester must also check that the child has fully understood the instructions. Test environment. Testing should be conducted in a quiet room with no auditory or visual distractions. This minimizes masking effects of background noise, and avoids confounds due to the child's attention being drawn away from the tests. Ideally, only the child and tester should be present during testing. Familiarization. A familiarization phase is incorporated into the protocol. It is performed prior to testing, and includes presentation of easy-to-identify suprathreshold stimuli alongside impossible-to-detect stimuli. This ensures the oddball paradigm and forced-choice test formats are understood. The tester can then provide further clarification if necessary. Familiarization is further facilitated by beginning each test with easily identifiable target stimuli so the child enjoys an immediate sense of success. Lapses of attention. An incorrect response early in the track due to a temporary lapse in attention can result in an artificially elevated threshold. To minimize this, the track is automatically abandoned when an incorrect response occurs within the first two trials. Tracks can be restarted a maximum of three times before testing is aborted for that particular test. Minimization of boredom. AP track durations are designed to be short (20 trials) and each take between 1.5 and 2 minutes to complete. Listening and cognitive tests are interleaved within the test sequence to maintain a sense of novelty for the child. Finally, the 'forced-choice' method allows the child to work at his/her own pace. Engagement. The tests are presented as fun, computer games to play. They include child-friendly graphics that change for each game. The cartoon animal or human characters move dynamically with each stimulus presentation and response (Figure 3). The child's attention is directed to each character and the sound that it makes by means of a 'bouncing ball'. The ball also indicates to the child when to respond. Auditory and visual feedback is given after each response, and there is an indicator to show how far the child has progressed through the 'game'. Figure 3. A screen shot from the IMAP test battery showing different features in the program interface that have been designed to maintain child engagement. Motivation and rewards. Although the procedural aspects of test presentation in the IMAP battery are controlled by IHR-STAR, it is essential for the tester to also engage with the child throughout testing. This involves providing positive motivational feedback between tests to engender a feeling of success. Cartoon stickers and certificates are given on completion of testing, and stickers may be used as rewards during testing if necessary. For research studies, age-appropriate information sheets for both child and parent are sent out prior to the test session. The tester welcomes the child and the parent (if present) and briefly describes what will happen. For testing in a research context, informed written parental consent is obtained if it has not been obtained previously. The child's assent is also obtained. An anonymized participant ID number is entered into the appropriate box on the ID screen and this is then automatically appended to all data files collected as part of the test session. One out of 10 possible pseudo-randomized test sequences is automatically selected and testing begins. The tester introduces the first AP game display to the child and explains the test procedure prior to placing the headphones on the child and starting the familiarization phase for the test. This phase is completed automatically when a preset criterion (e.g. positive response to 4/5 trials) is reached. The child then enters the main testing phase. Tests are presented automatically according to the computer-controlled sequence. Prior to each test, the tester instructs the child as appropriate, and gives positive feedback and further encouragement as and when required. On completion of the test sequence, the child is rewarded with stickers and a certificate. If present, the parent is provided with a verbal summary of their child's results. These are compared against age-specific norms to account for developmental differences between children. Further management is discussed as appropriate. Figure 4 provides examples of good and poor performances for two different children. In the good performance (left panel), the child consistently identifies the 'odd-one-out' and both tracks rapidly converge to the same threshold for intensity level. In other words, both the between- and within-track responses are highly consistent, with minimal deviation. This performance suggests on-task attention has been maintained throughout both tests. The right panel shows response tracks from a younger child. It is clear, from the rapid convergence to threshold on the first track, that the child has understood the task. However variations in on-task attention are also apparent in both the first (blue) and second (red) tracks. In the first track, the child responds with reasonable consistency up to the last four trials where the child provides a succession of errors, resulting in a higher final threshold than might have been predicted earlier in the track. During the second track, the child fails to achieve performance comparable to the lowest level of detection that was observed in the earlier portion of the first run. There is a succession of six incorrect responses, leading to a progressive increase in the presentation level of the target up to approximately 40 dB above that of the first track. Correct responses then follow, at around trial 13, and the child continues with a series of correct responses until the track finishes. The large inter-track response variation, in conjunction with the large intra-track difference for the second track, suggests a lapse in attention rather than a problem with AP per se. Figure 4. Two representative graphs demonstrating of performance that can be obtained even when procedural effects are minimized. The left panel is an example of consistent reliable performance for both the first (blue) and second (red) tracks. The right panel provides evidence for lapses of attention after initially good performance (blue) track compared to the second (red) track. Click here for Appendix A.
Click here for Appendix B. Good listening skills (i.e., AP) are believed to provide a firm basis for the further development of important cognitive skills such as speech, language and literacy1-3. Yet, there has been much debate about the nature of the relevant listening skills, if indeed they are relevant, necessary, or sufficient for causing difficulties in language or literacy4. Part of the problem for understanding the role of listening skills in cognitive development reflects the fact that children are very variable in their ability to perform taxing and, from their perspective, rather dull tests of AP ('psychophysical tasks'). This makes it difficult to separate out procedural effects, such as boredom, from more fundamental variations in functioning of central auditory processing pathways. As we have detailed in our protocol, the IMAP test battery was carefully designed to minimize confounds arising from issues associated with the test procedure. In Figure 4, we provide comparisons of performance of two children on a backward masking task. Because IMAP minimizes procedural confounds, and children cannot begin the test until they demonstrate they understand it, we can be confident in ascribing the different performances of these two children to test-specific factors for each child. The inclusion in the IMAP battery of paired AP tests5 and a range of cognitive tests further permits us to explore the reasons for this individual variation. We recently completed a UK population-based study using IMAP5. This showed how response variability and performance on tests tapping cognitive skills, such as attention, explained most of the variation in performance on the AP tests. The population-based study also provided us with standardized measures of performance. These measures are necessary to assess individual performance in the clinic. They are currently being used in a study investigating heritability of listening skills in identical and fraternal twins. This latter study will permit us to develop standardized measures suitable for use with children in the US. Though currently child-focused in design, IMAP can also be used with adults, as demonstrated by Strait et al.,6 who found an important contribution from cognitive skills honed by musical training to the development of auditory processing skills. The research and development leading to the IMAP-test battery and IHR-STAR was funded by the Medical Research Council (MRC) and a grant from the Oticon Foundation. Thanks go to Lorna Halliday, Sally Hind and Alison Riley, who provided help in the planning stages of the work and Sonja Ratib and team for testing the IMAP test battery during the large population-based study or auditory processing. IHR technical and support staff provided invaluable assistance with the project - we particularly acknowledge the contributions of Tim Folkard, Victor Chilekwa, Dave Bullock and John Chambers. Tallal, P. Fine-grained discrimination deficits in language-learning impaired children are specific neither to the auditory modality nor to speech perception. J Speech, Lang, Hearing Res. 33, 616-621 (1990). Tallal, P. Improving language and literacy is a matter of time. Nature Reviews: Neuroscience. 5, 721-728 (2004). Wright, B. A. Deficits in auditory temporal and spectral resolution in language-impaired children. Nature. 387, 176-178 (2008). Bishop, D. V. M., Carlyon, R. P., Deeks, J. M., Bishop, S. J. Auditory temporal processing impairment: Neither necessary nor sufficient for causing language impairment in children. J Speech, Lang, Hearing Res. 42, 1295-1310 (1999). Moore, D. R., Ferguson, M. A., Edmondson-Jones, A. M., Ratib, S., Riley, A. The nature of auditory processing disorder in children. (2010). 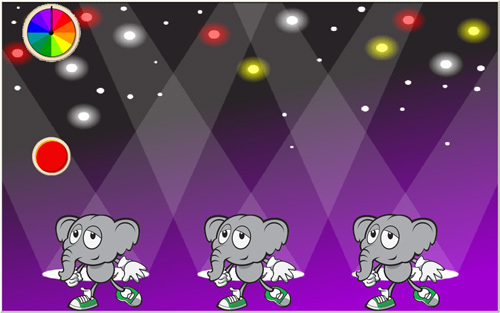 Strait, D. L., Kraus, N., Parbery-Clark, A., Ashley, R. Musical experience shapes top-down auditory mechanisms: Evidence from masking and auditory attention performance. Hear Res. (2009). McArthur, G. M. &, Bishop, D. V. M. Frequency discrimination deficits in people with specific language impairment: reliability, validity, and linguistic correlates. J Speech, Lang, Hearing Res. 47, 527-541 (2004). Ferguson, M. A., Hall, R. L., Riley, A., Moore, D. R. Communication, listening, speech and cognition in children with auditory processing disorder (APD) or specific language impairment (SLI). J Speech, Lang, Hearing Res. Forthcoming Forthcoming. Wechsler, D. WISC-IV(UK). The Psychological Corporation, Harcourt Brace & Company. London. (2004). Korkman, M., Kirk, U., Kemp, S. I. NEPSY: A developmental neuropsychological assessment. Psychological Corporation. San Antonio. (1998). Bishop, D. V. M., North, T., Donlan, C. Nonword repetition as a behaviour marker for inherited language impairment: Evidence from a twin study. J Child Psychol Psyc. 37, 391-403 (1996). Barry, J. G., Yasin, I., Bishop, D. V. M. Heritable risk factors associated with language impairments. Genes Brain Behav. 6, 66-76 (2007). Wechsler, D., Chen, H. -Y. Wechsler Abbreviated Scale of Intelligence. The Psychological Corporation. New York. (1999). Torgesen, J. K., Wagner, R., Rashotte, C. Test of Word Reading Efficiency (TOWRE). Psychological Corporation. New York. (1999). Bishop, D. V. M. The Children's Communication Checklist-2. 2nd ed., The Psychological Corporation. London. (2003). Smoski, W. J., Brunt, M. A., Tannahill, J. C. Children's Auditory Processing Performance Scale. The Educational Audiology Association. Tampa FL. (1998).